I was in the grocery store today and got involved in a conversation involving the pluralization of several words in English that have been borrowed for other languages. It appeared a number of people were drawn into this conversation. I believe it may have started over a question on the pluralization of the word uterus. I am not sure why anyone would need to know that, while standing in line at Safeway, but there was probably some tabloid story about mutant uteruses or something. I really wish the space next to checkout was reserved for things I am really likely to forget, like coffee, TP, half and half, and dish soap. One couple believed that Uterus should be pluralized as uteri. Their example was that the plural of octopus is octopi. And I shall now explain to you what I explained to them and I am sorry if you are crushed forever. 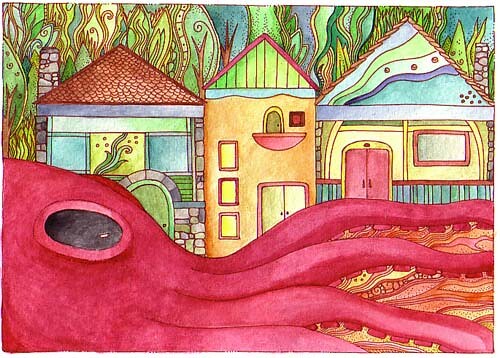 The word Octopus is a a borrowed word -a Greek word. The plural in Greek is Octopodes. Since English words are generally pluralized by the addition of an "s" or "es", Octopuses is the correct English plural. However, many people try to pluralize it as Octopi, under the mistaken assumption that Latin words are pluralized by changing the a "us" ending to "i". This might make sense of Octopus WAS a Latin word, but it is a Greek word. Sadly Octopi is now considered "a correct" plural but only because people kept using it and would not shut up and so now the dictionaries have bowed to that sad failing. Uterus, on the other hand (I confirmed when I got home,) IS from Latin, so the appropriate plural is Uteri, though Uteruses is also accepted in English. You may need to know this In the event that you need to discuss more than uteruses at a time, which may not happen every day or ever in line at Safeway. I tried to see if Uterus meant anything interesting in Latin, like "small organ that hurts" or something but no, it appears to just mean womb, which I translate as small organ that hurts. And pluralize, as needed, as uteruses. palace, a photo by megan_n_smith_99 on Flickr. I have here for you a page you can color. The image shown here, which I uploaded to Flickr, is a lower resolution image. You can downloaded the higher resolution page to color here. There are a lot of details so I suggest you use fine tipped markers or colored pencils. Enjoy! And I'd love to see your results if you want to share. Fire Bird, a photo by megan_n_smith_99 on Flickr. First I want to share a link with you from Anne Lamott who I love to little tiny pieces. (but I leave all the pieces attached.) Anne Lamott on Finding Time. Actually, are finding time and making time the same thing? Not exactly. I need to think about that. It's ironic that I am talking about this on my blog because it mentions how being hype-rconnected on-line eats at creative time. This is something I try to be aware of, and I've cut down my list of daily reads to make more time to draw, paint, read, heck even just sit. Sometimes just sitting is much more nourishing than say, reading Regretsy. Actually, Regretsy has gotten a bit less funny and a bit more mean and I am well served by sitting instead of reading it. I am not saying not to connect on-line. I suspect many of my readers are loner-artists like myself who have had a hard time finding members of their tribe in their home towns but have connected with amazing people on-line. I am just saying to be aware of how much time you are spending and then decide if that's ok with you. I know I am way better off taking a 10-minute walk than, say, playing three games of boggle on my phone. Please don't tell my phone, it will be heartbroken. So, having gotten through that.. Here is another of my paintings. I actually achieved a goal here - using less colors. I have so many great colors and sometimes I try to use them all at once and it does not always work. Or it works but the piece would be stronger if I did not use so many colors. I actually bought some new small-palette to use with specific carefully chosen colors. I use Daniel Smith watercolors. Some of the colors I used here are: Quinacridone Gold, Quinacridone Magenta, Quinacridone Burnt Orange, Cobalt Blue Violet, French Ultramarine and Phthalo Turquoise. I think there was a purple or 2 in there but I am not sure which ones since I mixed them. DS has some really nice purples. Pueblo, a photo by megan_n_smith_99 on Flickr. I have been fascinated by the architecture of SW Native American tribes since I first saw photos - probably when I was in grade school. I have not seen any in person - yet. (Some are open to the public.) The Southwest is one of my favorite places and I hope I do get to spend more time there. So far I've only been to Colorado, New Mexico and Arizona. “That’s the idea.” Loyd seemed as pleased as if he’d built it himself. I think that is a good description. Houses built from earth and stone, nestled in earth and stone.
" I would have never noticed them had signs not pointed them out from various cliff edges along the canyon. The dwellings seem fit only for misanthropes or outcasts, but were actually households that simply chose to use the environment to their advantage. Much of Anasazi* architecture, from pit-houses to cliff-dwellings, is logical blending with what’s already there rather than an attempt to outdo nature." *Anasazi was not what the Mesa Verde dwellers called themselves. Again from Pierre Tristam, Anasazi is " a Navajo word that means either “The Old People,” according to the great historian Samuel Elliot Morrison, or “enemy ancestors,” according to writer Alex Shoumatoff (the Anasazi were the Navajo’s sworn enemies), or “ancient ones,” “ancient foreigners” or “ancient enemies,” depending on which National Park Service brochure you read." I believe it is now PC to call the Mesa Verde builders "Ancestral Puebloans" since the Pueblo tribes are descended from them. And so, I have painted my idea of the Pueblos, caught between earth and sky, suspended, rising from the earth with swirls of dust. Mehndi roses, a photo by megan_n_smith_99 on Flickr. & my am-reading or to-be-read (or reread) stack includes more Julia Cameron, More Anne Lamott, and more Natalie Goldberg. I find it inspiring to read books on creativity, and I have found more the kind of books I want to read about writing than about visual arts. And I used to write, and I still do a bit. I am working on a non-fiction project at the moment. But I have known for a long time that I wanted to write more and be more open. Various things have happened over the years, and there has been some inertia or something... the end result being that while I am very creative and spend a lot of time creating I am not feeling very connected to a creative community. And after close to a year and a half of looking for a job I am more motivated than ever to see how or if my artwork or other creative endeavors could support me full time, because that would be my dream job. So I've been trying to understand a bit what people connect to on-line. It seems to me that a lot of what people connect to is a personality, as much as the product of that personality. And I don't have that sort of personality. All of the best of what I have is already in my artwork - I am not sure what is left. 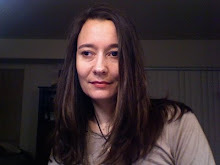 I have been reading all year though about writing and thinking I would like to write more open and honestly and connect to people with words and not just images. I've noticed that all of the most popular blogs (that a lot of people connect to) seem to be connecting mostly with words. The exception being web-comics. So Maybe other people don't "read" pictures the way I do. Well these are all things I am thinking about. If it goes well you may see more writing from me here. We'll see. I know I struggle with a lot of things many people struggle with and might connect to: creative block, depression, a difficult time finding balance between various aspects of my life, living with chronic pain, etc. But I'm nervous about being honest about those things. Even though I don't think anyone should be ashamed of those things and I admire people who are honest about those things. Well. We'll see. threebirds, a photo by megan_n_smith_99 on Flickr. This is the most recent watercolor I have completed, though I am working on some other things, including a series that no one has seen but me. I'm enjoying that series but also struggling a little with the line between doing a body of work and being "too repetitious". that repetitious bit is possibly my inner critic talking. I recently finished two very different books about old growth forests - or what little scraps are left of them, anyway. Mythago Wood by Robert Holdstock and Winter: Notes From Montana by Rick Bass. They both made me want to go out to the woods. But not today, it's been pouring for hours. I had read Mythago Woods before, years ago, and it was not a strange as I remembered it being, but I think I had a high fever the first time I read it. I really need to do some chores today but I hope to paint too. Ammonite, a photo by megan_n_smith_99 on Flickr. It's so sad that ammonites are extinct. They had such an interesting structure. Though not really surprising since 98+% of all species that have ever existed are now extinct. You think it could not happen to us? Well, ask Geological time. The closest living relatives to the ammonites are cephalopods - squid, octopuses* and cuttlefish. They are less closely related to nautiluses - though they do resemble them. "The name ammonite, from which the scientific term is derived, was inspired by the spiral shape of their fossilized shells, which somewhat resemble tightly coiled rams' horns. Pliny the Elder (d. 79 AD. near Pompeii) called fossils of these animals ammonis cornua ("horns of Ammon") because the Egyptian god Ammon (Amun) was typically depicted wearing ram's horns.Often the name of an ammonite genus ends in -ceras, which is Greek (κέρας) for "horn"." The first ammonites appear during the Devonian, about 400 million years ago, and the last species went extinct about 65 million years ago, at the end of the Cretaceous, also called the K-T boundary. The K-T extinction is the most famous mass extinction, but not the only one, and not even the biggest. The biggest was at the end of the Permian era. I could probably go on and on about mass extinctions, even before I started studying geology and paleontology my freshman english 101 paper was on the K-T mass extinction, I am sure that was a 1st, I think my english teacher enjoyed it as a refreshing change of pace. That's what you get for letting students pick their own essay topics. Maybe I will go on about them a bit later, but I am feeling under-the-weather this week so I leave you with this painting of an ammonite. *Please don't get me started why the plural of Octopus is not Octopi. It has actually become acceptable via common use but it's just so wrong. Landscape in Mist, a photo by megan_n_smith_99 on Flickr. Summer is still a time of mist and fog in the Pacific Northwest. Most mornings lately I've woken up and looked out my window, not able to see the hills across the ship canal. Listening to fog horns in the distance. 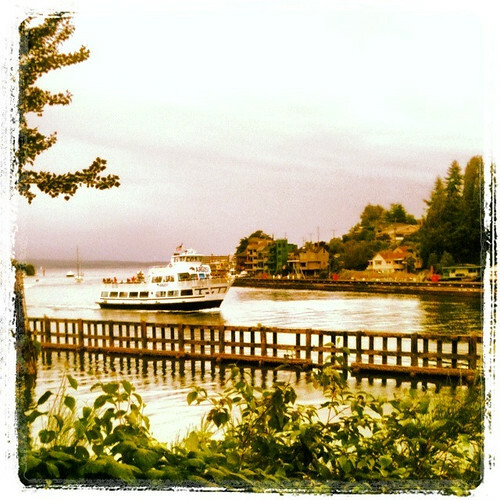 On Vashon Island, where I grew up, we used to stand out on the corner in the mornings, waiting for the school bus. The fog was often so thick that all we could see were 2 glowing lights approaching. We used to pretend we were under water, watching some leviathan approaching. Those memories and feelings have probably shaped my notion of landscape, or earth and sky. Salmon Bay, a photo by megan_n_smith_99 on Flickr. This photo was taken from Commodore Park. It's on the South side of The Hiram M. Chittenden Locks, over near the fish ladder. I manipulated this photo in instagram. I like the sort of vintage look of this filter. My grandmother and her parents might have seen the view from this angle when the locks opened in 1917. My grandmother was 8 years old and went through the tunnel under the locks before it opened (now flooded). She was so afraid someone would "turn on the water" that she cried. teensy baskets, a photo by megan_n_smith_99 on Flickr. I've been working on these when I need a break from painting. The largest one here is 1.75" across. The yarn is mostly Koigu KPPPM. They are inspired by Native American baskets , though the form is also a lot like Chihuly baskets. His were inspired by Native American baskets too. I think I need to make a trip over to the Burke museum to visit their baskets, particularly the one made by Chief Sealth's daughter, Angeline. She used to live in a little shack where part of the Pike Place Market is now, and she sold her baskets on the streets. Little House in the Woods, a photo by megan_n_smith_99 on Flickr. Cozy as can be house." It's 8 x 8" and available on Etsy. These words do make appearances in my art and writing. I think I'll keep adding to the list as I think of it. Dragon Scales 2, a photo by megan_n_smith_99 on Flickr. A couple of days ago I posted the 1st part of this commission - this is the 2nd part. I had a good time, as always, playing with color. After having focused on black and white for most of the last 6 weeks I thought it might take some time to transition back to color but it happened right away. ok, this was short, i am back to the color mines. For You I built a World, a photo by megan_n_smith_99 on Flickr. Pardon a quick entry this morning - I finished this drawing I've been working on and below is part of the Etsy description of it. Maybe I will have more time to post again later today - I've got errands to run and art to make! This intricate drawing creates a world and draws you in - into the forest of night or the forest of sleep. And you will meet creatures who will protect you and look over you. This would be a great painting to hang in a child's room or in a cozy reading corner or anyplace that needs light in the dark. dragon scales, a photo by megan_n_smith_99 on Flickr. When i was in 3rd grade, on Vashon Island, my twin sister's teacher, Mrs. Eggleston, gave her whole class permission slips for their parents to sign, giving her permission to pick up all her students on saturday nights, on her flying dragon, and take them to the dragon's cave. sometimes on monday mornings the students would find glass "gems" on their desks. i was allowed to participate too because my twin was in her class. I am sure that, and an early viewing of Rankin/ Bass' animated version of The Hobbit influenced my idea of dragons. When I was a teenager, I drew dragons almost every day - wild colorful furry dragons inspired by Chinese dragons and by The Luckdragon in The Neverending Story film. And today I still do not have dragons out of my system, so I still paint colorful layered scales. This painting was for a commission but there are 2 smaller ones in my Etsy Shop. The job interview today did not actually happen. The job listing did not mention that a car was required. The telephone interview did not mention it. The job application did not mention it. But when I got there the interviewer asked me if I had trouble parking and I said that I took the bus and she asked if I had a car. I said no and she explained that the company would not hire anyone without a car and showed me out. It was rather discouraging. It's an office job, not a driving job. It's the first time I have found myself in this situation when a car was required for any employee at a business that did not involve driving or delivery. Back to the job hunt AND back to the drawing board. Actually I am finishing a large drawing now and hope to have it done to show you tomorrow. Spīritus Ephēmeros / Forest Creature, a photo by megan_n_smith_99 on Flickr. forest and field. These creatures are largely ephemeral, like a wisp of mist or a flickering flame of a candle, but in certain circumstances they may gather into more corporeal forms. This little creature is 5 x 7" and is available on Etsy. I have a job interview in Redmond tomorrow, wish me luck. gatherer, a photo by megan_n_smith_99 on Flickr. It has been a good weekend. I was in a lot more pain than usual for about a week and finally the last 2 days have been better. It's also finally been sunny and I've been spending more time outdoors, and less time on-line. I like to sit in the park or outside a tea or coffee shop, drawing. I really need to make up a set of half pan watercolors to bring along. I use my tube paints like pans, really. After I use them I let them dry and then rewet later to use again - so I could just take the palettes I guess but I have 5 or 6 of them going at the moment. I really need to decide what colors are mandatory and make up a more simple travel palette. My watercolors are for the most part small and therefore portable. As of late I've been taking pen and ink and pencil as my portable projects. There are so many things I want to draw, paint, sew, and knit. There is never enough time, though it is still better to have more ideas than time, rather than the other way around. Of The Deep, a photo by megan_n_smith_99 on Flickr. I am sort of glad the 4th is over. I am just not a huge fan of explosions of any kind. Also it's a well known fact that summer does not really start in Seattle until after the 4th. Some might argue that summer NEVER starts in Seattle. I think I am okay with that at the moment because as much as I'd like more sun, I am glad it is only 65* out at the moment and we are not having water rations or forest fires. This little drawing is white Prismacolor on black paper, which I really enjoy working with. An art supply store just opened in my neighborhood! It's very exciting. I went in Sunday and bought 4 white Prismacolors from open stock and I can see I'll be going back soon. I go through them pretty fast, and the sad thing about Prismacolors is that the lovely soft lead is prone to shatter. So never EVER drop your Prismacolors. I did not drop any of these but one of them has been breaking a lot. It's the high clay content that makes the pencils soft, but also prone to breaking. They are lovely, though, so if you've never tried them but are interested in drawing with pencil or colored pencil, I do recommend them. Luminous World, a photo by megan_n_smith_99 on Flickr. This painting is from last year. I am really enjoying working in pencil, but I miss watercolor and I have a commission so I will be doing some watercolor again soon - maybe later this week. Most of the colors featured in this watercolor come from Daniel Smith's quinacridone watercolor set which my friend Jesse gave me for Christmas a couple of years ago and which I still use all the time. Tube watercolors really go a long ways! Actually, good watercolors really go a long way. I still remember when I was about 15 and I got my 1st good watercolor brush. I was still using cheap watercolors but having a good brush was pretty exciting and allowed me to achieve details I never could have managed otherwise. I can't remember exactly when I started using good paints. 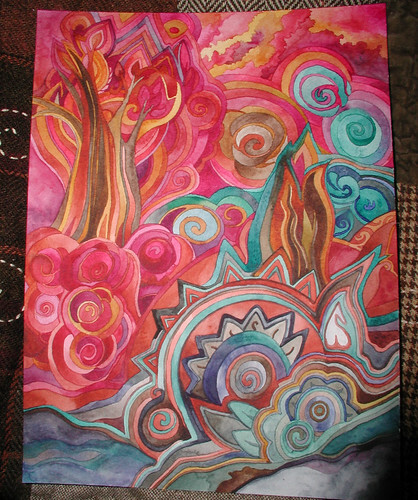 I might have used Koi tube paints first - they are not that good really but better than dime-store watercolors. At some point I had a tube set of Winsor and Newton Cotman tubes - only I think they were called London then. And at one point I also had a travel set of Winsor and Newton pans. Then I bought my first Daniel Smith tubes and I never looked back. I would like to try some more brands still, and I'd like to try some higher-end pans, but watercolors are expensive and I am really set for colors with all the DS tubes I have now. There is really something to be said for using quality art supplies. Luminous World is available on Etsy. It is 9 x 12 inches. Camping For Cats, a photo by megan_n_smith_99 on Flickr. There is serious art and then there is whimsical art. This is the whimsical kind. It is refreshing to do something cheerful and fast in between wrestling with more serious and time consuming things. Camping For Cats is available on Etsy. *this is actually a true story. 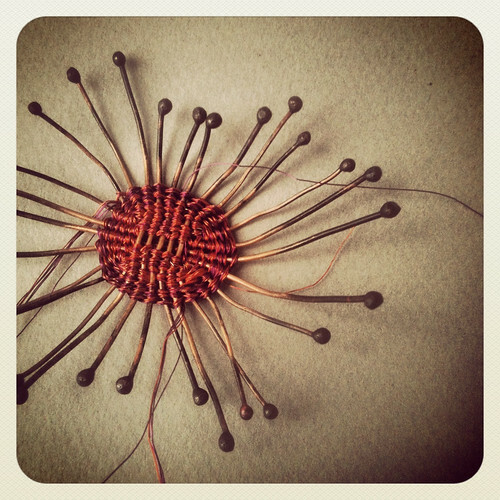 Twinned basket in progress after marilyn Moore class., a photo by megan_n_smith_99 on Flickr. On Saturday I took a class at Fusion Beads called "Egg Basket: Oval Twined Wire Bowl". The class was taught by Marilyn Moore. I have wanted to take one of Marilyn's classes for years, so I was excited. Marilyn is a great teacher. This is my egg basket in progress - for reference the bit I have done is about 1" across at the widest point. I had a little trouble getting the hang of it - I actually think I would have learned it faster if I had no textile experience - I've done a lot of things that involve various types of woven structures but this was my 1st experience at twining. I am, however, enthused by the possibilities and am excited to finish my basket and see what ideas I can come up with on my own. The basket "ribs" are 18 gauge and the twinning wires, held in bundles of 6 or 7, are 32 or 34 gauge. I started with copper and fuchsia wires but plan to introduce some purple.